Greatmats Perforated Click Garage Tile is manufactured from durable no-break polypropylene and rated for 10,000 pounds per SF. 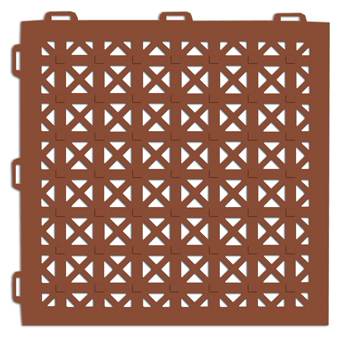 This drainage interlocking garage flooring tile features an octagon angled rib that is unique to the industry and provides additional grip when the tiles are wet. Water will drain through this tile very quickly and the top surface of this tile will not hold any moisture. This plastic interlocking garage floor tile an excellent choice for wet areas for automotive and foot traffic. These garage tiles are rigid and will not flex when vehicles are driven on them. These tiles are 5/8 inch thick and 1.01 x 1.01 feet in size. Perforated Click Garage Tiles are available in black, red, and grey colors. Our unique interlocking snap together tile design is computer engineered for repeated installations without degradation to the interlocking tabs on the tiles. You can easily take this tiles apart and use them for portable flooring at car shows. These tiles can also be cut to size if necessary. Border and corner ramps are available in black for this product. For other garage tiles, visit our garage flooring page.